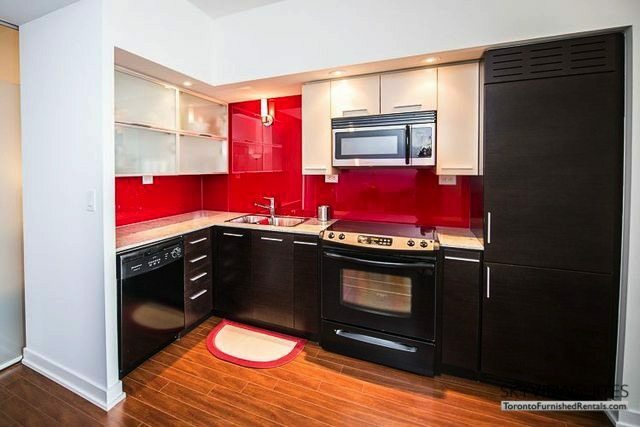 Toronto furnished apartments are well-liked by renters who need a short-term living arrangement. Since they are becoming more in demand, the price is being adjusted. Just like regular condos, there are different grades of quality and craftsmanship. The suite is clear because of the floor to ceiling windows, hardwood flooring throughout, except in the bedroom where there’s broadloom carpeting. The square footage of this modern and trendy two bedroom fully furnished apartment is approximately 750. To further that, there is a balcony that oversees the courtyard and water feature. Openness is what defines this space; the living room is decorated with fashionable furniture and colourful artwork. Next to it is the dining area with a stylish table which can happily seat four. Neighbouring that is the astonishingly current kitchen with its red backsplash and granite countertops with remarkable fixtures. The elegant hardware flows through into the washrooms; each bedroom has a private restroom with floating sinks and espresso colored vanities. Additionally, each bedroom has a queen sized bed, one with a custom Murphy bed that closes up when not in use. There’s a desk in there as well, moreover, an extra workspace is cleverly created in the hallway which can double as a makeup station or study spot. You can find a vast number of things to do in the Luna building, the amenities are extreme. If you must work out there’s a fitness center full of machines, a yoga/aerobics room, a sauna and change rooms. Cool off with a dip in the rooftop pool, or bake in the sun for that bronze look. If you’re not afraid of the dark you can view a movie in the private screening theatre, or play pool at the billiards room. A massage and manicure room exists, and you can have a private party. You can reserve the dining room and use the full sized kitchen or rent a guest suite if you like. Now, for what to do outside: there is an island dining area with themed cabanas and connecting rooms. A heated whirlpool, and lap pool with infinity edge are available as well as a waterfall, water steps and an outdoor rain shower, an alfresco bar and urban forest.